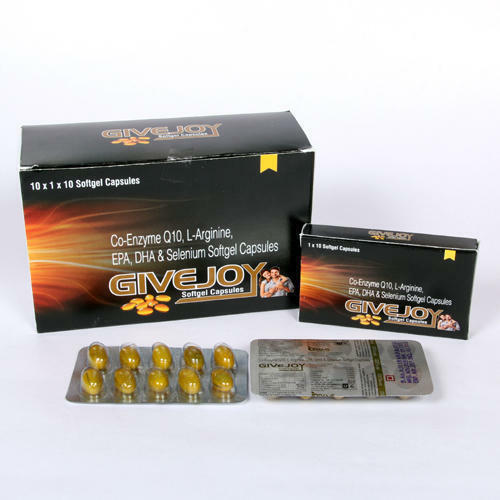 Our organization has gained a renowned position in the market by offering premium quality Givejoy Softgel Capsules. Functional since 2014, we, Drams Healthcare [Panchkula], are accepted as leading wholesaler and trader of a superlative range of Pharmaceutical Medicines. Our broad catalog of medicines comprises of Pharmaceutical Tablets, Pharmaceutical Injections & Pharmaceutical Syrup. Our offered medicines are widely appreciated among our customers for their efficacy, purity, longer shelf life and precise formulation, owing to their procurement from authentic vendors. We have accumulated highly reliable vendors' support which is thoroughly screened by our skilled procurement agents under quality fabrication stringent parameters. Due to our firm perspective of providing effective and budget friendly medicine, we have been able to outreach our competitors and export our medicines. With the aim of the uttermost fulfillment of customers' precise requirements, we have developed high-end infrastructure system. Our infrastructure encompasses modern quality inspection unit and commodious warehousing facility for hygienic and tampers proof packaging of medicines. We have a strict fixture to quality standards during an inspection of procured medicines in terms of their formulation and effective functionality with longer shelf life. Moreover, our spacious warehouse is equipped with ultra modern packaging machines for defect proof packaging by using finest grade packaging materials. Our company has easily catalyzed the delivery time of consignments through our credible logistics, high-speed transportation, and broad distribution network.